No home is complete without a shrunken head or two. They're great conversation starters when you have people over for dinner--and when you're not entertaining guests they make excellent paperweights. Unfortunately, it's not always easy to get your hands on the real deal. 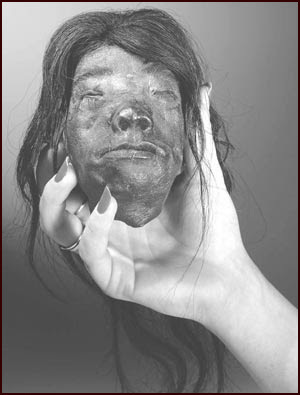 So why not make your own shrunken head? All it takes is a strong stomach, a few basic ingredients, and a friend. All joking aside, when I found some instructions for preparing shrunken heads, I was surprised by how easy it seemed. However, the process IS a bit gorey (to say the least), and I don't recommend reading about it unless you're planning to pursue a career as a coroner (or a member of a crime scene clean up crew). You DID want gross, didn't you? Kitty! I thought you were one of the people who WANTED something gross! There were shrunken heads in the third Harry Potter movie...they were always cracking jokes and making inappropriate comments. Nice...I love it!! XD You always deliver, Kirsten! for some time now I've been wanting a shrunken head but i just can't seem to find one or how to make one that looks like an acutal real shrunken head. so if you would could you tell me where you found how to make one because the picture you have up looks like a real one. I don't want to go kill a person ( I wouldn't do that) just to make an awesome looking shrunken head. seriously, how do you make a shrunken head? i'm intrigued.